Of those making the Jan. 18 cut, some finalists made enormous promises of tax incentives to lure the 50,000-job project, while others predicted to be a shoe-in for the final list didn’t make the cut despite large incentive packages. However, most tax incentive proposals among the finalists remain shrouded in secrecy. Finalists include expected landing spots such as New York City and Newark, New Jersey, where then-governor Chris Christie (R) recently signed a bill ( P.L.2017, c.282) providing up to $7 billion in tax credits. Shunned are Detroit and Windsor, Canada, which promised in their joint bid to let Amazon.com, Inc. keep new income tax revenue generated by their Detroit employees for 10 years and half of those taxes for the decade thereafter, according to local news reports that received copies of the confidential bid. Amazon estimates it will invest $5 billion into multiple buildings to create its second headquarters, where it projects workers will make an average of $100,000. This project set off a firestorm of bids and media attention, and experts have called it the largest deal linked to a corporate headquarters in U.S. history. State politicians in New Jersey pointed to the announcement as an indication that incentives were a large factor. With some exceptions, the details from most proposals remain a secret. Some states, such as Colorado, have described their pitch as “frugal but responsible,” while others have remained mum on any details. Other finalists were more nuanced. Austin Mayor Steve Adler (D) spoke briefly in response to the Amazon announcement, stressing that contemplation of economic issues required an inventory of urban impact in addition to public input. “The city council has taken action to focus all of our economic development conversation around the city’s greatest challenges and needs, and, for us, that’s mobility and affordability—that’s the lens we’re going to use,” Adler said at a morning news conference. “I would also say—because I’ve been asked the question—I still not have heard any conversations about offering incentives,” he said in a video posted to Facebook. “Ultimately, there needs to be a very open and transparent community conversation about Amazon and all of these related issues,” Adler said. But silence doesn’t mean incentives were left out of proposals, Paul Rafelson, a Pace University law professor told Bloomberg Tax Jan. 18. The state, along with Boston, coaxed General Electric to move its headquarters to Beantown with roughly $276 million in economic and infrastructure incentives, according to an analysis by the liberal Tax Policy Center. Another finalist, Columbus, Ohio, wouldn’t divulge specifics of its proposal. But Ohio has provided more than $123 million in previous incentives to develop fulfillment and data centers in the Buckeye State. Analysts have predicted that several aspects of Amazon’s bid could steer them toward certain cities that check all the boxes in the retail giant’s request for proposals. Anderson Economic Group’s initial projections based on business services, cost of doing business, and ease of transportation were correct on eight of its top 10 picks. The list predicted 16 of the 20 sites. Some other factors, such as cost of land and price for labor, could also drive the decision. Amazon anticipates it will need up to 6 million square feet of office space and plans to invest about $5 billion for its second campus. Rafelson, a tax attorney who represents a group of Amazon sellers, said this could steer the company away from high-price areas such as New York City and toward more development-friendly and cheaper labor cities such as Newark or Atlanta. Rafelson isn’t alone. Overseas betting markets are predicting Boston, Austin, and Atlanta have the best chances of winning the bid. Reactions were mixed, as some states boasted while others kept calm and carried on. “Massachusetts put forth a comprehensive proposal that showcased the Commonwealth’s global innovation economy, world-class workforce and leading higher educational institutions across the state,” Lizzy Guyton, spokesperson for Massachusetts Gov. Charlie Baker (R), said in a Jan. 18 statement. 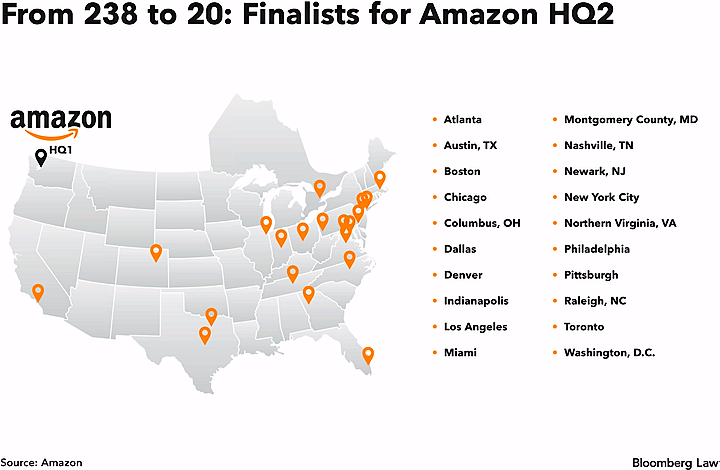 Amazon’s selection bid for Massachusetts includes the cities of Somerville and Cambridge as well as Boston. Chicago Mayor Rahm Emanuel (D) issued a Jan. 18 statement praising the Second City as a finalist, saying inclusion in the list “makes clear that Amazon recognizes Chicago’s great strengths,” which he said included access to talent and transportation. “All you have to do is spend an hour walking around town and you will have a very clear and deep understanding of the opportunities, optimism, and future of the motor city,” he said in a Jan. 18 statement.